Find a primary source related to this week's topic (even better to find one you could incorporate in your week end blog post). For ideas on where to find sources, see: Resources. Read and analyze the source. Use your primary source analysis checklist as a guide. Post a series of 4-5 tweets about your source. Each tweet should include: A) the number of the post(1-5), and B) the class hashtag #nd_sf. Due by 2PM on the date listed on class schedule. Write for your peers as professional colleagues. To curate a collection of sources for the class to use for blog posts and coursework. To gain skills in using social media for scholarly and/or professional purposes, and to cultivate a digital presence. 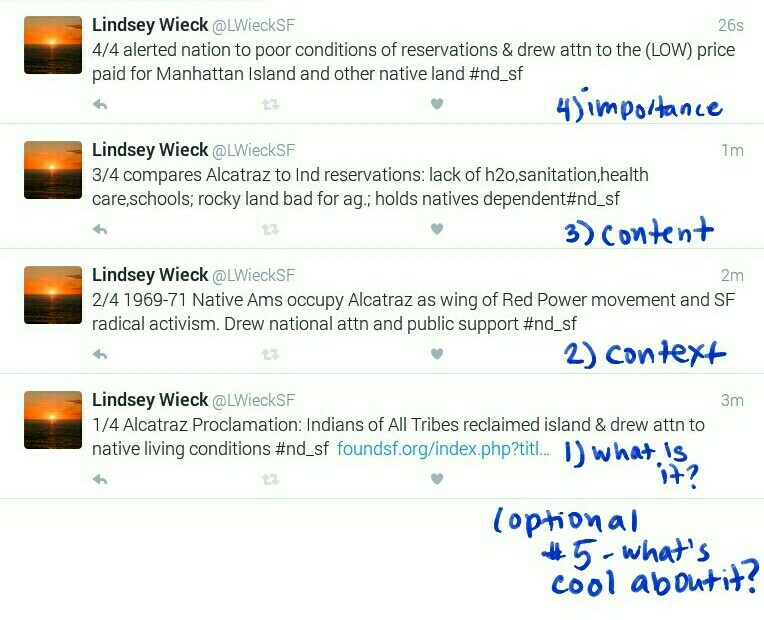 Twitter primary source assignments will be graded on a five-point scale. 3-4 ✓ Meets all guidelines. 1-2 ✓ - Completes assignment but content is lacking or does not complete all guidelines.